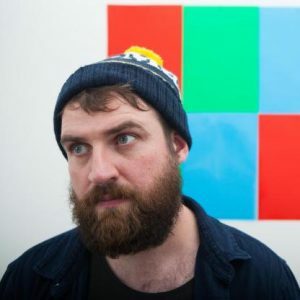 TEA BREAK WITH… Pictish Trail aka Eigg-based musician Johnny Lynch, winner of the public vote to be shortlisted for the SAY Award and head of the Lost Map record label. You’ve just played Glastonbury. How was that? Intense, but fun. I think I maybe had too much fun, but I can’t go into details about that here. It’s completely different to every other festival I’ve been to – the scale of it is just beyond comprehension. You see a different side to people. Everyone is relaxed, care-free, and not judging one another. The culture is inclusive, everyone belongs. I’m lucky to have been there five or six times now, and this year I performed three shows across the Friday and Saturday. The logistical team they have there are so efficient, everything ran smoothly and perfectly. You album Future Echoes won the public vote to be shortlisted for the SAY Award. What was your reaction? What do you think it was about that album that connected with people? When I found out I had won the popular vote, I was actually stunned. I was with a friend at the time, when I found out, and tried to play it cool … but, later, I was a bit emotional. I had received a lot of comments and messages on social medial from people that week, saying how much they had enjoyed the record, and connected with it, and it really touched me. It’s a pop album about dealing with closure, and finding hope – and one person had messaged me to say that the album had helped them come to terms with their father’s passing. That sent me into a spin. What do you make of the shortlist – any personal favourites there? I think I’ve only listened to three of them, and one of those is mine, which is definitely a personal favourite. The other two are Meursault’s and Sacred Paws, both of which I’ve really enjoyed. The Meursault album is a starkly beautiful collection of songs, and there’s a lot of different textures on that record. He’s a complicated character, Neil Pennycook, but a very talented one. You are putting on your Howlin’ Fling festival on Eigg on July 28 to July 29. Can you tell us about the line-up? One of my all-time heroes, electronic producer James Holden, is coming up to play – and he’s bringing a full band with him, which I think is a first. It’s pretty much my dream booking. Jon Hopkins was the first act we confirmed for the weekend, another pioneering electronic artist, and a great friend. There’s a lot of pals playing, actually – KT Tunstall, Withered Hand, François & The Atlas Mountains, Bas Jan, The Poozies and a heap of stuff from the Lost Map label. What’s it like on Eigg when you put on your festival – is it something the islanders get involved in? The islanders have been really supportive, and helpful over the years we’ve put the event on – I wouldn’t be able to do it without them. They’ve been really enthusiastic, helping out with the set up of the camp-site and music/ catering site. They’re always the first on the dance floor when the music begins. Well, something has just happened, something that’s come out of the blue, and it’s made me rethink a lot of things. I can’t really talk about it yet, but it’s exciting. I think this Howlin’ Fling on Eigg is going to mark the end of one chapter, and maybe the beginning of another. But maybe I’m just being overly dramatic. I blame the post-Glasto comedown. Lost Map’s Howlin’ Fling takes place over the weekend of July 28 and 29, Isle of Eigg, and is sold out. Pictish Trail plays Edinburgh‘s Summerhall on August 24, details tba. www.summerhall.co.uk Future Echoes is out now on Lost Map Records.